The 8th edition of MLA (April 2016) uses one universal citation format for all types of sources regardless of publication format. Researchers need to locate the CORE ELEMENTS of their sources and then use them in the order listed below. Skip any elements that aren't relevant or that aren't included with the source. Containers, a new MLA concept, are the elements that hold the source, or, WHERE the source is from. Containers could be books, journals, series, websites, blogs, databases, etc. 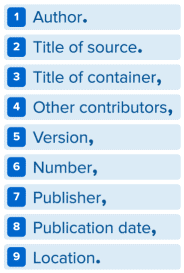 There can be multiple containers in a single citation (an article from a database would list the journal title as one container and the database name as a second container; a TV series watched on Netflix would list the name of the series as the first container and Netflix as the second). Use the punctuation marks that are shown. Italicize titles of self-contained works, such as books. Use quotation marks for poems, stories, articles, or essays. Teach yourself MLA with these videos and tutorials. The Cite/ Export button is your friend. Most online databases like Ebsco, ProQuest, and JSTOR will generate a citation for the item that you are viewing in one of many different citations formats, including APA, MLA, and Chicago/Turabian. You can then copy and paste the citation directly into your list of Works Cited. This box shows an MLA citation for the article "Of Mice and Mountain Lions" from the box above.